1) They call themselves a platform and not a stock agency, so contracts are directly between the buyers and photographers. "Wemark is a growing community of leading independent photographers licensing their photos directly to customers, with no agency involved." The big problem I see there is the volatility of every cryptocurrency, there's a huge risk $1 commission to become 1 cent just in one night. I have not read the details, but crypto-payments aside, are they planning to use the block-chain technology to keep track of the way images sold through them are being used, thus enforcing their copyright? If yes, this can be a break-through worth paying attention to. The other big problem is that there has been no word that I've seen about any sort of marketing of the agency to potential buyers. If this is just a place to host your images with no marketing other than what the contributor does themselves, then I can't see what the attraction is. Marketing and sales generation is the hard part. I don't see how they have anything to appeal to buyers. Their premium content isn't exclusive and is overpriced. For example, I found a large collection of images from an outfit called Mint Images that is also on Alamy and Dissolve (with the same content). Wemark's prices are much higher than Alamy prices for the same images. What type of stock imagery buyer would prefer to obtain images where you have to deal with the volatility and hassle of buying tokens? What large corporate buyer is going to put up with this extra hassle? Just to add one more concern on the currency part, there will be currency conversion from WMK to ETH/BTC and from there to USD. To do so we have to go on exchange. First we have to pay fees on the transaction(inside ERC-20), then fees on the exchange and most likely fee for the withdrawal. With small amounts will be expensive, to hold for big amount is very very risky in crypto, because until the moment of withdraw this WMK can value hundred times less(or more of course). It won't necessarily make any difference. Thieves will steal, international law is prohibitively expensive, and block chain won't make one iota of difference to that. How is blockchain any better than having your copyright in meta (where it's still in the thief's use?). Yes that's part of the plan that they are selling us. All sales are tracked and have an ID. Remember Kodak Coin and that place, hasn't ever gone live. Also after watching video, it appears that the guy who started Wemark, may have started Picasa at Lifescape in 2002, Picasa which was sold to Google. While true, that's a bit over stated. 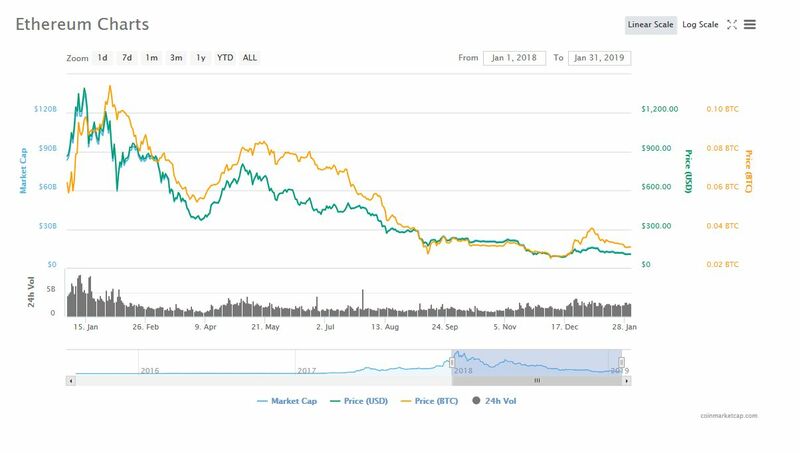 At the same time, crypto seems to have stabilized after all the whooha and investing. Companies that went into mining for profit have found their projected earnings are falling. It's not the boom it was, and it was a bubble and Tulips. But for our interest, the values have become more stable. And yes, you could have $1 today and 90 cents tomorrow, or $1.10 tomorrow. I don't like playing the market with my earnings. Home Run - Marketing? Content is same as all the rest. Higher prices on some. Extra hassle for a changeable currency. Fine point and I made the same mistake. These are Tokens, not Coins. On the surface the sell to us looks good, but what about the buyers? I'd say the most positive part would be, it costs us nothing to upload and watch? I'm just going to watch... or if I do upload some content, I'm going to price it for what I think the fair price is, if someone found it on SS, AS or Alamy. I will not compete with myself on price! Here's Etherium for the last year. (and I'm calling this stable?) After the three peaks, I think we've seen the last of the boom and fad investors. We can all watch for six months and see how that prediction works out. But back to what Jo Ann wrote. Imagine you are a buyer and want photos, you buy some WMK and your $100 is $90 the next week, before you spend it. For us, we get paid and can watch for a peak and cash out to our wallet, or just sit on the money and hope. Every time I read something new, I learn more and I still haven't bought into the whole cryptocurrency will be disrupting how the world does business. So far it's just an interesting technology and has some future potential. The theoretical is grand and imaginary, reality is different. My experiment continues. It seems I need to set up some kind of magic beans wallet...can anyone give a non technical steer on this? If its going to cost be anything I'm out. "WMK is an ERC20 token, so any wallet that supports this standard protocol will automatically support WMK. A popular for storing your tokens is MyEtherWallet but we recommend doing some additional research to decide what’s right for you." Hope its simpler for buyers or its going sink. I can't find any metrics on the site either. Opening a ERC20 token wallet is free. I use MetaMask for that purpose. First person to get a download there and actually turn their coins into money, cashing out for useful currency, wins a cookie or a biscuit. Be the first to report your achievement here. Wemark aside, one distinct advantage I can see is that a blockchain ledger can quickly and easily provide dispute resolution in the case of a copyright infringement claim. For example, instead of going through hoops proving to a site like SS that you are actually the legitimate copyright holder of a stolen or suspect work - which can take a lot of time during which your account will likely be suspended - you can simply point to the original copyright registration and that is that. Same goes for DMCA takedown notices or even threatening letters from your own lawyer. If I have filed for a copyright, I have the proof, why do I need Wemark? How is blockchain different from now for disputes? I've got an Irish lawyer using one of my Alamy pics he presumably lifted from a legit sale. The copyright notice is in the metadata, so it's not disputable. He has ignored contacts from Alamy, a registered letter, two emails and three phone calls from me, and an IP lawyer pointed out the costs of pursuing it further, DMCA being irrelevant outwith the US. I can't imagine how blockchain would resolve this situation. He knows it's my copyright, there's no dispute about it, but he knows I'm not going to throw hundreds of pounds at getting it resolved (Under EU small claims, I'd have to physically go to the court for the hearing, so return flights and probably two nights accommodation needed, and no expenses are payable). Essentially, you have unwitting infringers (those who genuinely don't know any better, and there are still many of these) and knowing infringers. The first will usually at least take down on the initial contact. The second just sit pretty smirking. Blockchain is often cited here as being the solution to unpaid-for uses, but I can't see that it will make one bit of difference. Interested to hear why others think I'm wrong. You don't. That's why I prefaced with "Wemark aside..." I am not talking about Wemark but rather standalone blockchain copyright registration services. If you are already formally registering your copyright elsewhere non-digitally, then that's a different story and I don't necessarily see any advantage for you. Other than perhaps the ease and costs associated with proving your ownership elsewhere. For me the ease and cost (free) of using a blockchain ledger to register my stuff makes a lot of sense; and long before someone else rips it off and registers it as their own. To me it's all about the collection and clients. This blockchain thing is on secondary importance for success. For now i see a good Premium selection and the website works smoothly, but we'll see what about the clients. No I think you are totally correct. Month delay on images going live after approval! Where do the images live? Bad Behavior has blocked 66698 access attempts in the last 7 days.